Condo Culture | Rental Property Investment: New or Resale? Rental Property Investment: New or Resale? Last Friday we shared the why, and today we are sharing the how. But before we do, we want to thank you for trusting in our ability to help you make this new year your best year in real estate investing. Last weeks blog highlighted 5 reasons why condos should be part of your investment portfolio in 2018 and today we want to share the two ways you can get into the market. We can assure you that at the end of this article, you’ll be one step closer to confidently landing a decision and building wealth for yourself and your family. Ready to be a landlord and take on a rental property immediately? What is your initial response to this question? Would you prefer purchasing a property you haven’t walked through and seen or would you lean more towards an existing property that is up-and-running? If you’re a beginner, it may not be crystal clear as to which method may be a better opportunity or which is most suitable for your individual situation. If you’re a serial investor, you may have had some time and experience to learn which investments tend to be the best investments but as you've probably also learned, it tends to be more about the specific investment opportunity itself than the type. Opinions differ widely on the topic and everyone tends to have their preference and pre-disposition as to what's best and what they're most comfortable with based on past success or their own personal situation. We can’t promise to give you a simple cookie-cutter answer to unlock what is a better option, but what you can get excited about is learning the the benefits and risks associated with pre-construction and resale. Here we go! When considering a resale investment, a major benefit is having the ability to physically walk through the unit, determining if it is the right match for yourself and for your future tenant. No floor plan, no guessing! Another advantage investors face when purchasing a resale unit is no waiting period. This is HUGE! From the moment you walk-through the unit, to the moment you sign all the docs, you can often have the keys to your new investment in 30-60 days. There are also investment opportunities with a tenant and rent already established and in place, increasing financial certainty and providing a real estate investment that's truly turn-key. The very nature of a resale unit also enables you to start driving income and paying down your mortgage right away unlike a pre-construction investment where initial returns are driven almost entirely through market appreciation and purchasing smart and securing a unit at below market value. Lastly, when it comes to mortgages, you can get your mortgage pre-approved immediately based on the current rate which can not just increase your certainty in lending costs as well. One of the first things that appeals to pre-construction investors is a lower financial obligation. Often deposits are between 15%-20% of the unit value and this gradual deposit is usually spread anywhere between 6 months to over a year. With a deposit structure allowing for installments, you as the investor have more financial flexibility and less demand on upfront cash flow than if you purchased a resale investment with a quick closing. During pre-sales, developers are motivated to gain sales momentum and get to required pre-sale numbers for construction financing. This motivation can lead to generous discounts, the best selection of units, and opportunities difficult to come by on the resale market. While its true that its becoming incresingly difficult to purchase pre-construction units at highly discounted rates, opportunities still exist and if you're purchasing early enough, in the right project and in an area with the right fundamentals, phenomenal opportunities do still exist. Investment bulk deals, something the team at Condo Culture works on often, can further increase the discount rate and drive incentives below below posted pricing published publicly. Wondering what this is or how you can get involved? Shoot us a note and we'd be happy to take you through an example of how buying together as part of our investment group can help get you a better price on your next pre-construction investment. As the market gets more competitive, we're also seeing more and more developers offer rental guarantees which can offer great peace of mind. In a appreciating market, arguably the best thing about pre-construction investing is how low maintenance it is for you as the investor. While you don't have immediate income like a resale investment, you also have no expenses, no management is required and your investment continues to grow with the apprecation of the market. You simply put down your deposit and wait for the building to begin construction and move towards completion. You then often have the option of simply assigning your unit (essentially selling your contract on the unit to another purchaser) or carrying it through to completion and obtaining a mortgage on your unit. If you carry it through to completion, you also usually have the opportunity to choose all of your own finishes in the unit and when we're on the leasing side renting suites for our investors, we constantly find tenant's being attracted to and willing to pay a premium for well-designed suites. Well designed suites tend to rent faster too so having a keen eye for design or hiring someone who does to help you through the process can definitely pay further dividends when it comes to finding the right tenant, renting your suite quickly and establishing your initial rental rate. Another subtle but great advantage when buying pre-construction. The simplicity attached to the urban lifestyle is becoming increasingly appealing to young professionals and empty nesters. 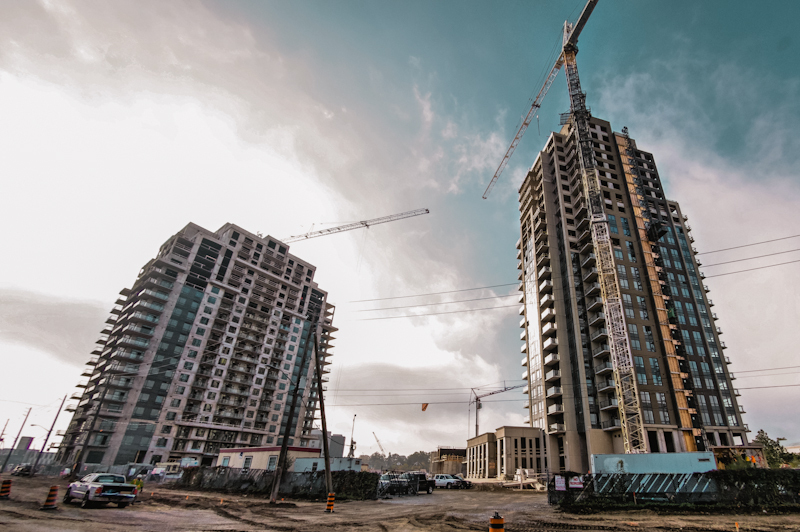 More condos are being developed in our cities and as the condo market continues to evolve, we’re seeing a steady increase in tenant occupancy versus owner occupancy. So whether you’re leaning towards a resale or pre-construction rental, the good news in the current market there’s strong demand for both. Real estate investing is an exciting venture. You will have questions upon questions along the way, and the good news is, you've got us here by your side for the entire ride. Everyday we help investors like you idenitify opportunities, run analysis, negotiate the best deal possible and even find their first tenant. Whether you've just started your search for an investment or are well along your way, reach out to us with questions anytime. There's nothing we enjoy more than helping an investor build their portfolio and find success through their real estate investments. Questions or comments about this weeks newsletter? Reach out to us and let us know! We're here to help and would love to take you through a few real-life case examples of resale vs. pre-construction investing so you can compare and see what the right move is for your next investment. Happy Friday and stay warm fellow KW & Hamilton residents!